Twistix® helps remove plaque, tartar and freshens breath using co-extrusion technology for Triple Action cleaning power. The green color has vanilla, peppermint, parsley and chlorophyll to freshen breath and the white color contains sodium hexametaphosphate, which cleans teeth by removing plaque and tartar during chewing. 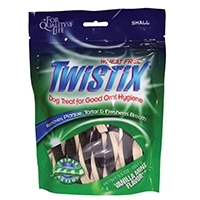 Twistix is another new and exciting product based on our wheat free technology. The "Green" freshens breath while the "White" removes plaque and tartar buildup during chewing. The unique "Green & White" combination will keep your companions teeth healthy and sparkling between regularly scheduled veterinarian visits. Key Attributes: Wheat Free for companions with sensitivity to wheat. Unique twisted shape improves plaque and tartar removal during chewing.